Your nose is running. Your body aches. You know you got that cold from your seven-year-old. The work project you've been struggling with is due Friday, and you keep telling yourself, "I just don't have time to be sick." No career-committed mother wants to give up her precious time to illness. But the truth is if you don't make time for your health, you will have to make time for illness. Whether an individual, a business or a large organization, being seen in the search engine marketplace counts for everything. Like any valuable tool, you must know and understand what you are working with, to make it work for you. This session is a panel of selected professionals who have years of experience in search engine marketing for small businesses, large organizations and advertising agencies. 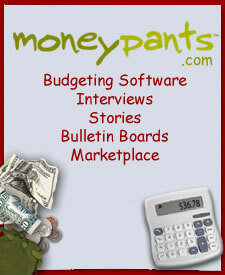 MoneyPants is the online personal finance community for women. Track Your Goals, See Your Progress, Reach Your Dreams! Natural and man-made disasters like SARS, 9/11, the Tsunami, the London bombings, Katrina, and the threat of bird flu have elevated national and international awareness and disaster preparedness. Executives and operational managers need to be ready to respond to the next disaster as well as building greater resilience across the enterprise, while managing costs. This event will discuss the increasing demands facing CIOs, business continuity, disaster recovery and emergency management professionals during a time of crisis. For more information, visit www.technologyexecutivesclub.com.